Following its sister brand Case IH, which introduced a continuously variable transmission option for its Steiger and Quadtrac articulated tractors, New Holland has added the option to its T9 range. James Rickard reports. 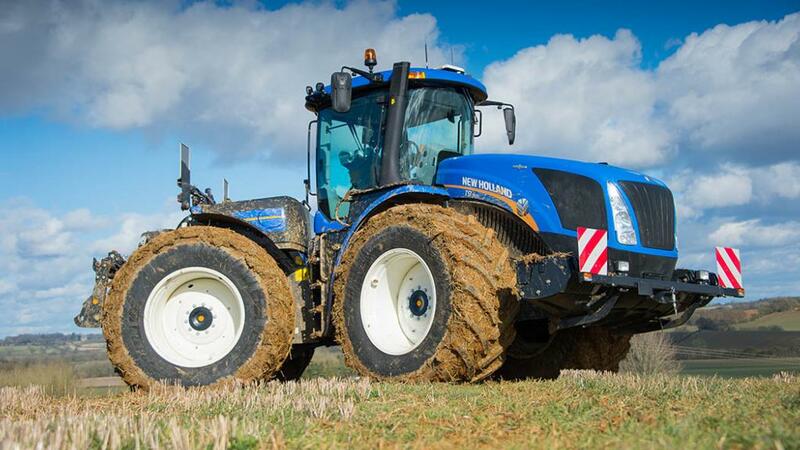 New Holland introduces CVT option to its flagship tractor series. 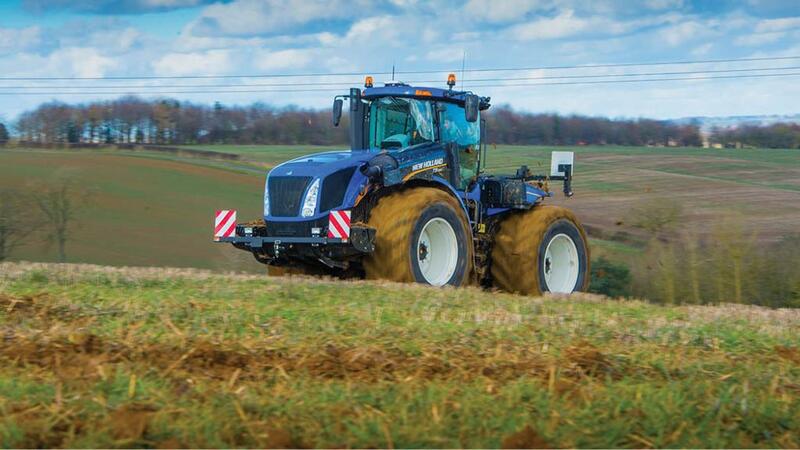 Building on its continuously variable transmission (CVT) offering, currently available on its T6, T7 and T8 tractor ranges, New Holland has now introduced the option to its flagship series, the T9. Available on five out of the seven models in the articulated T9 range from 435 to 613hp. For now, the top two models in the T9 range stick with the firm’s UltraCommand powershift transmission only. Unlike the manufacturer’s current AutoCommand CVTs which have been developed in-house, the new option has been developed in partnership with renowned transmission maker ZF. Graham Gleed, New Holland’s high horse power product manager explains; “It is very much a case of economies of scale. While there clearly is a demand for this type of transmission in this power bracket, the sales volumes versus cost to develop CVT technology currently means it is not justifiable to produce our own transmission for this tractor. The new CVT is rated to just over 600hp, hence limited model availability. Along with sister firm Case IH, both it and New Holland are said to have exclusive use of this transmission for now. Benefits of the new transmission to the T9 are said to be improved efficiency, smoother operation and much easier to control. A road speed of 43kph is also possible at just 1,600rpm. “Granted, a powershift will still be more efficient than a CVT in certain conditions. If you were cultivating for instance and the topography and ground conditions rarely changed, then a powershift could be more efficient. But in UK conditions which vary massively, then a CVT's adaptability means the most efficient engine revs and speed ratios will always be selected,” says Mr Gleed. Similar to the CVT in the long wheelbase T7 and T8 model, the CVT in the T9 also uses four mechanical ranges. While the changes of these are practically imperceivable, it means at four points within the tractor's speed range from 500 metres per hour to 43kph, it provides 100 per cent mechanical transfer of power, says the manufacturer. This roughly occurs at 3, 8, 16 and 35kph, depending on engine revs and CVT ratios. In addition, mechanical transfer does not dip below 60 per cent, says New Holland. Commonalities continue with the transmission's maintenance requirements – the same oil as used in the powershift versions can also be used in the CVT. Both the transmission and hydraulics share the same reservoir, requiring a change every 1,200 hours. 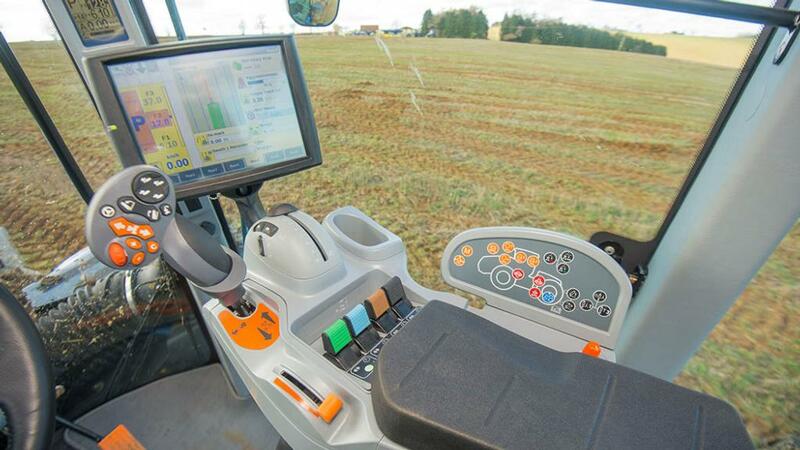 Control of a T9 AutoCommand is consistently the same as the smaller tractors in the range, using exactly the same controls including the firm's SideWinder II armrest incorporating a return-to-centre type joystick. The latter sees speed altered by 'pulsing' the lever forwards or backwards – the further you push it, the greater the acceleration or deceleration. In addition, the foot pedal can also be used with no need to manually switch between the two – the tractor will recognise which one you are using. The foot pedal is also a novelty on the T9 AutoCommand, as only a decelerator floor button is only available with powershift models. The power train (engine and transmission) can be operated in one of four driving modes; fully automatic with the tractor working out the most suitable engine revs and transmission ratio; cruise which sees a target speed selected with the tractor left to try and meet that target in the most efficient way; pto which sees selected engine rpm maintained regardless of forward speed selection; and fully manual whereby the operator takes control of engine revs and transmission ratios. In all modes, except pto, an upper engine rev limit can also be set, putting more emphasis on the transmission to compensate for changing work conditions and situations, thus saving fuel in the process, says the manufacturer. Three target speeds can be toggled between and finely adjusted via a thumb roller. 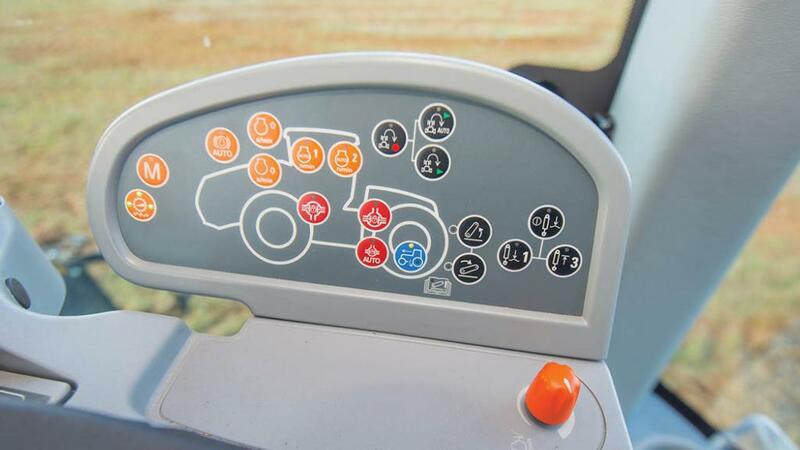 Active stop/start is also a feature of the transmission, which has the ability to 'hold' the tractor stationary on a hill, making it easier to come to a controlled stop and set off. A parking brake is also incorporated into the shuttle lever. With four tonnes of ballast flexibility, a short wheelbase T9 can vary its weight from approximately 15 to 19 tonnes. Even on 900/60 R42 (2.15m diameter) tyres, the T9's 42 degree steering angle means it has the same 10.5m diameter turning circle as the firm's standard wheelbase T7 tractor. Like the powershift equivalents, the T9 AutoCommand can be specified with pto and rear linkage, and up to six spool valves. As for future developments of the T9, the firm is said to be seriously looking into central tyre inflation technology – the key to making the most of the latest tyre technology. However, this is something most likely to be seen on smaller models in New Holland line-up first, suggests the manufacturer. 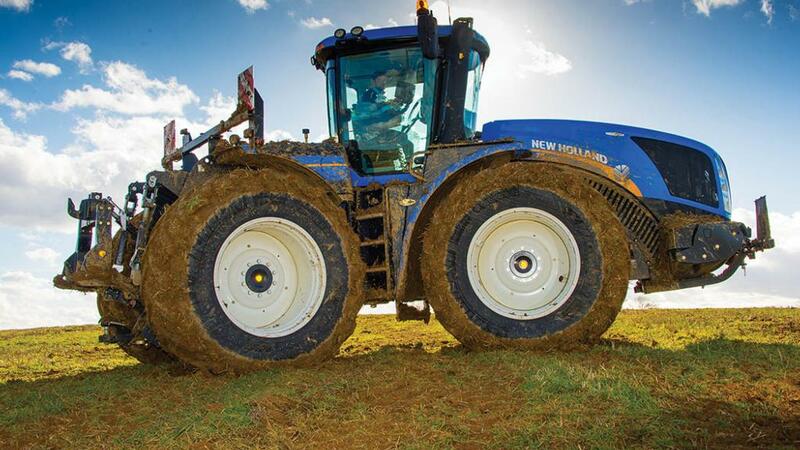 In addition, the T9 is due a facelift to bring it in line with the rest of the New Holland family – something we understand is in the pipeline. As for a tracked option of the T9 in the UK, currently there are no plans to introduce the American SmarTrax system. Prices of the T9 AutoCommand are TBC.